Teddy Long vs. Eric Bischoff: Someone Saw This and Thought, "We Need to Do This Again" - WrestleCrap - The Very Worst of Pro Wrestling! This year’s WrestleMania card is nearing its final stages, and this week we got our “Let’s Cram Some More People on the Show So Everyone Gets a Pay Day, And Hey, We’re Not Doing Money in the Bank This Year So We Need to Do Something” encounter: Team Teddy Long vs. Team John Laurinaitis. While some may scoff at the thought of someone like Ezekiel Jackson taking up a spot on the biggest show of the year, would you really rather it be a one on one showdown between Long and Laurinaitis? If so, allow me to introduce you to today’s induction, courtesy of Survivor Series 2005, in which Raw GM Eric Bischoff took on Smackdown GM Teddy Long. Why yes, that does means Teddy’s been in charge of that show for over seven years. I think that’s longer than Jack Tunney was in office. I love Teddy and all, but if that’s not a condemnation of all that is wrong in pro wrestling today, I don’t know what is. 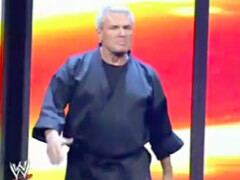 Bischoff makes his entrance first, with Eric strutting down to the ring wearing a gi. Actually, scratch that. It’s not really a strut, but a fast, yet not too fast, stride with a faux amount of fury. You know, if WCW had won the Monday Night War instead of the WWF, the most powerful man in the business’s gait of record would not be a goofball strut, but rather a power walk, the kind of which you see a 40-year old soccer mom doing outside of Old Navy at the mall. That never really hit me until now. 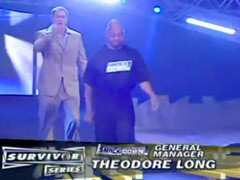 And yes, his opponent is one Teddy Long, who may be the longest running character on Smackdown today. Hey, remember when they used to call him “Peanut Head” in WCW? Yeah, I don’t know either dude. What I do know is that smug looking Teddy up there? You better be careful, or he may take your place, MMR. Man, you really are a one-trick pony. 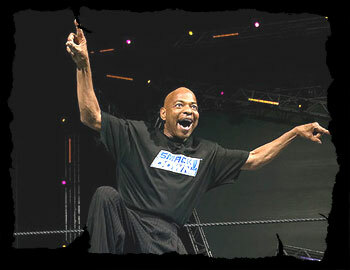 Oh yes, Teddy Long. Well, he’s escorted to the ring by Palmer Cannon. But you DO remember folks in WCW calling Teddy Long “Peanut Head”? For years, I’d hear about how great the minis were in Mexico. And if WWE taught me anything, they truly were! Imagine these fantastic athletes, bouncing on couches and doing spots that would make Sky Low Low approvingly nod his (oversized for his body) head. I bet they worked JUST LIKE THIS south of the border, right? Eh, the logo was cool at least. If it were for a children’s wreslting division. Which it wasn’t, but I digress. Teddy starts the match by getting in Eric’s face, pointing at him, then going to the turnbuckles to soak in the cheers. Go to the corner, have the folks applaud, then have the heel go to the other corner, have the folks boo. I’m thinking this may be a long night. Enraged (I guess), Eric charges at Teddy, who deftly dodges and proceeds to do a dance that I could best describe as a White Man Shuffle. I don’t know how is that even possible. Next, Teddy hops on one leg and does…the crane technique. Honestly, he’s so unstable on that one foot that I was almost hoping Palmer would hop in the ring to hold the poor guy up, or at the very least, put a kick stand on the side of his foot. And as if on que, Palmer does jump up to the apron, distracting everyone, and allowing Eric to attack Teddy from behind. And then he just stays up there, for like two minutes straight, doing something. …Bischof just kicked him in the back off and down to the floor. I don’t have the Observer in front of me where Dave reviewed this bout, but I’m guessing it was already in the negative star range here three minutes in. 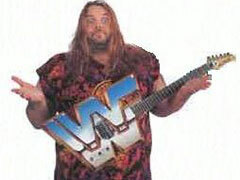 …the worst sleeper in the storied history of professional wrestling. No kidding, I’ve been “grappling” with RD Jr, teaching him how to shoot the half and apply the dreaded sleeper hold, and his is a zillion times better than the one you see to the left. And he’s six years old. Teddy escapes the horrendofic sleeper by hitting Eric in the head with his shoe. Eric counters with a KARATE THRUST, which sounds like something you’d find in the Japanese translation of the Kama Sutra. Suddenly, the lights go out, smoke billows, and we’re told the Boogeyman is COMING TO GET YOU! …and then pump handle slamming him, in the process proving himself to be the best worker in the match. THE BOOGEYMAN (!!!) WAS THE BEST WORKER IN THE MATCH. Whatever, it allowed Teddy to get the win. So yeah, this match sucked and all, but you know what? It gives me hope that the match at WrestleMania will be awesome. A Palmer Cannon/Boogeyman double run-in. I’d ask for the Junior Division to show up too, but that would be overkill. 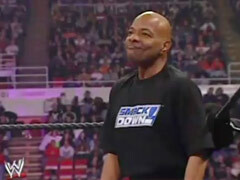 1 Response to "Teddy Long vs. Eric Bischoff: Someone Saw This and Thought, “We Need to Do This Again”"
Thank God that the Detroit crowd was woken up by the awesome Raw vs. SmackDown Survivor Series match to end the event on a seriously high note.